SYDNEY (AP) — One of the top prospects among 11 international entries in this year's Sydney to Hobart race is the New York Yacht Club's Privateer, which finished second in the Fastnet race in 2017. The Cookson 50, built in New Zealand and racing for 12 years, is owned by Ron O'Hanley. "This is a race that Americans love to come to," O'Hanley said. "I personally think this is the greatest sailboat race on the planet in terms of, if you think about the conditions and just its storied history, so it's something that we Americans aspire to do." Another American yacht, Joyride, also has good recent form, taking overall honors in the 2017 Van Isle 360 and 2018 Vic Maui races, both of which had taken more than 10 days to complete. Rather than returning home after the latter race concluded in July, it sailed to Australia via a stop in Fiji, as owner John Murkowski decided to do the Sydney to Hobart race. "It just seemed like we should keep going west and come down here and see what all the commotion was about," Murkowski said. The race, which begins Wednesday in Sydney Harbour, will also feature its first all-female crew, skippered by Australian Stacey Jackson but with sailors from Britain, New Zealand, the U.S. and the Netherlands. The tactician on Wild Oats X is Australian Katie Spithill, sister of America's Cup racer Jimmy Spithill. The 630-nautical-mile race (1,170 kilometers) takes the fleet, expected to be 86 yachts, down the southeastern Australian coast, across Bass Strait and into Hobart, the capital of the island state of Tasmania. Comanche, skippered by Jim Cooney, set the race record of 1 day, 9 hours, 15 minutes, 24 seconds while winning last year in controversial circumstances. 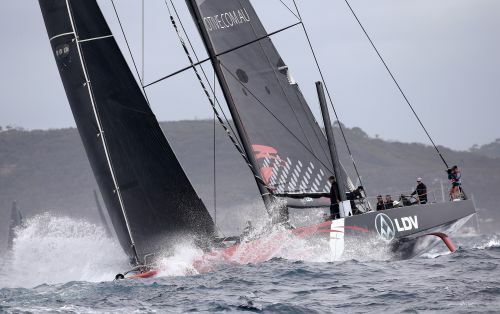 First-place finisher Wild Oats XI, which has won line honors nine times, was given a one-hour time penalty for an illegal tack on Comanche while still in Sydney Harbour, giving Comanche the win.